Learn about our upcoming events in the community from outreach to fundraising events. 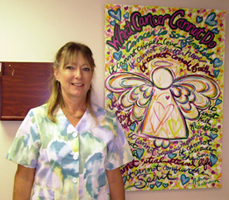 Art donations how we fill our non-profits mission of using donated money to help provide inspirational healing art to medical clinics. See donations to Cancer Therapy & Research Center (San Antonio, TX), Pasco Pinellas Cancer Center (West Coast in Florida), Texas Children's Cancer Center (Houston, TX), and East Valley Hematology & Oncology (Burbank, CA). We allow third party groups to use the art for fundraising in support of third party groups that support patients and caregivers. See example t-shirt fundraisers here. 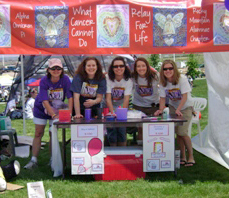 See our participation in the American Cancer Society's "Relay For Life" events. Due to our mission, we do not cover costs for printing, but we grant permission to teams to use our art. We have provided design assistance for booth banners, as well as, providing luminaria cards. See updates on our DonnaBellas Angels Blog. You can keep current on our news and event updates. Sign up for our email list to keep current on DonnaBellas Angels updates. We do not share or distribute names from our email list.